I hate having flowers go to waste, and after last month’s workshop, I had some extra flowers laying around. So, being that one of the things I’m working on in 2017 is self-care (how is that ALWAYS the first thing to fly out the window when things get busy?! 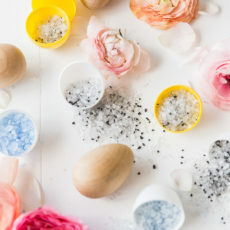 ), I removed the petals from the stems, dried them out, and turned them into a spa-inspired DIY. 1. 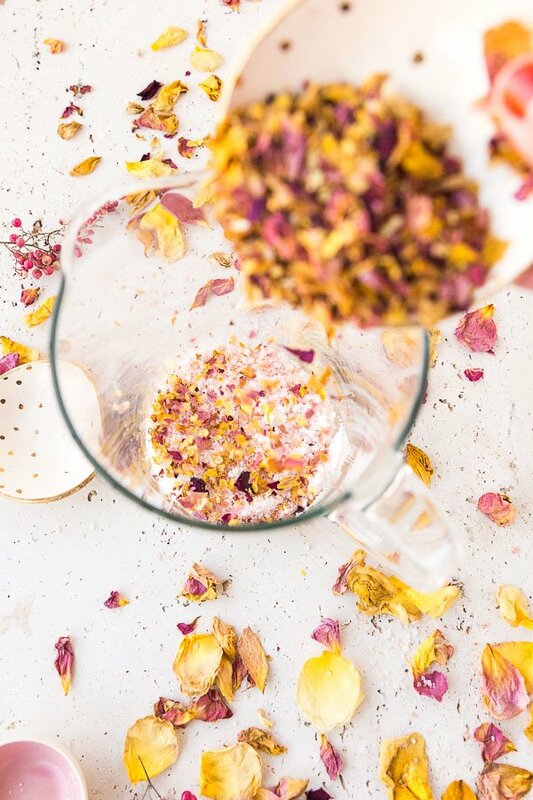 Start by drying out 1-2 cups of organic rose petals (you want organic roses if possible, since they’ll eventually be in your bathtub while you’re in it). I removed the rose petals from the stems and laid them out on a piece of canvas for 4 or 5 days (can’t remember which of the two it was, but you’ll be able to tell when they’re ready). Also, if you lay them out in a single layer, they’ll dry out faster. I had A LOT more rose petals than this DIY calls for. 2. Once the rose petals have dried out and look similar to mine, you can actually make the bath salts. And they’re super quick to make. 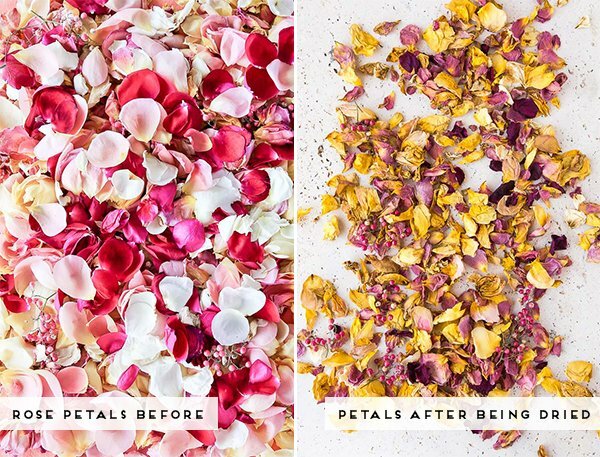 So all of that waiting you did when the petals were drying is about to be worth it! 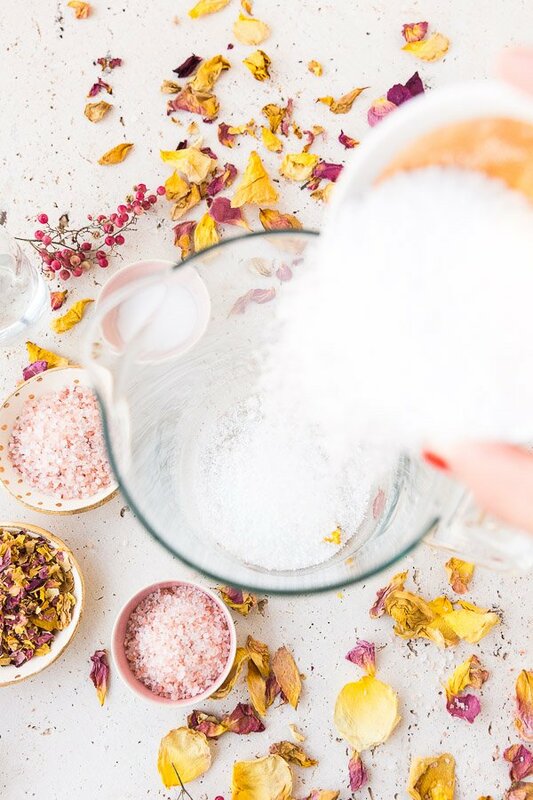 Mix the epsom salt, baking soda, and himalayan sea salt into a large bowl or container. Then, add in the drops of essential oils. 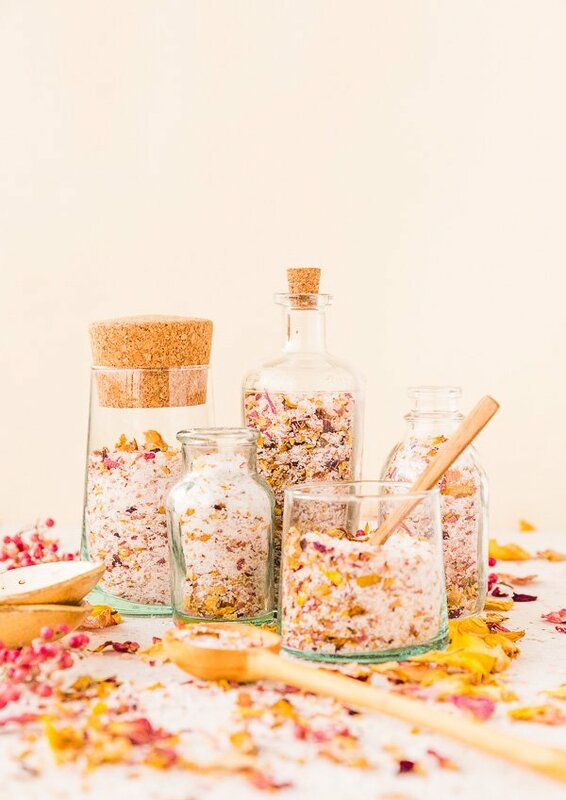 Depending on how fragrant you want the bath salts to be, add between 4–8 drops of essential oils. 3. 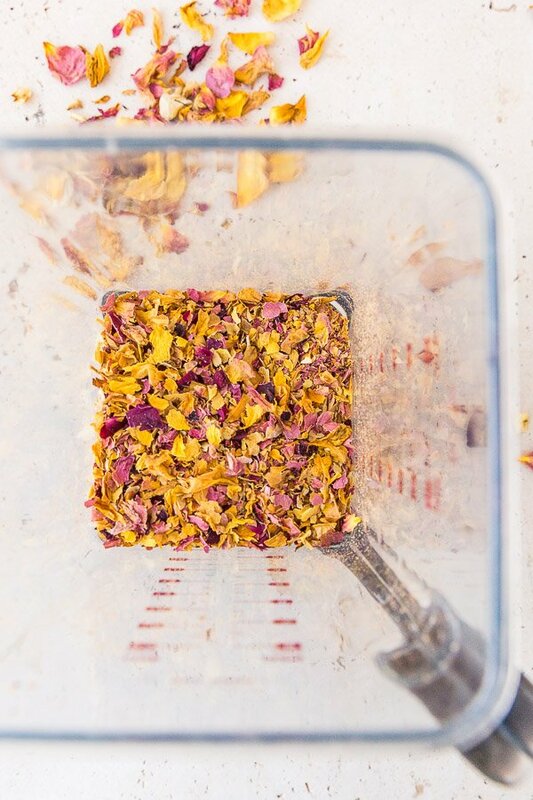 Next, pour your dried rose petals into a blender or food processor with sharp blades. 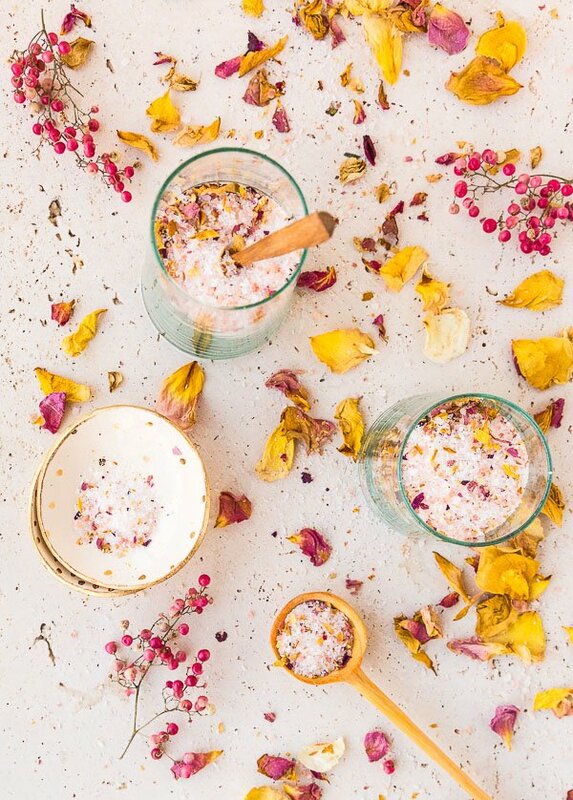 And set the blender or food processor to the pulse setting until the petals resemble confetti. This took a couple of minutes for me. I alternated between using the actually blender function and the pulse function on my blender and it worked great. This is the blender I have in case you’re curious. 4. 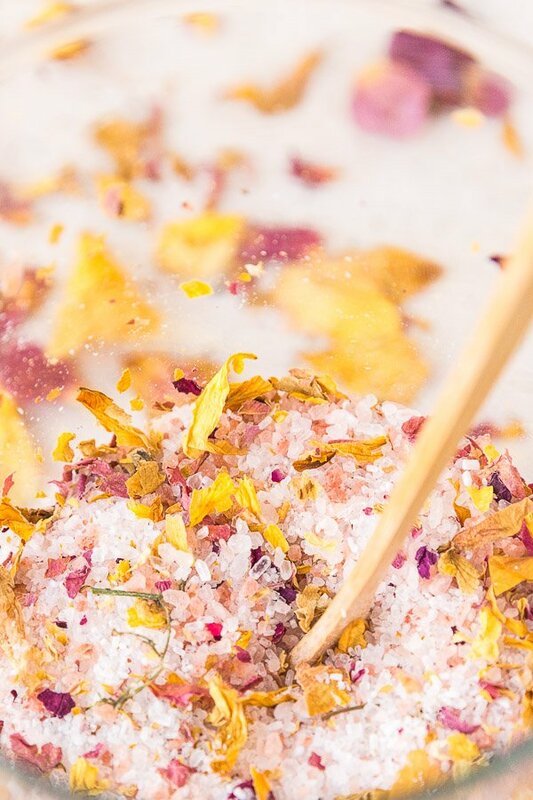 Once the petals are ready, pour them into the salt bowl and mix together with your hands or a spoon. Pour into decorative containers (one that has an airtight lid is best – my cork tops are mainly for show). 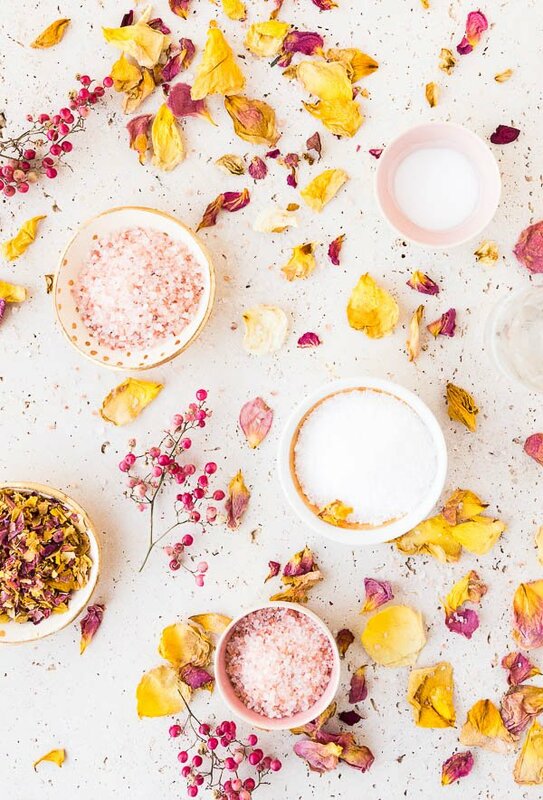 Add 2 ounces or so to your next bath and you’re feel like you’re hanging out in a fancy spa. Are you including self-care in your list of goals for 2017? Think you’ll give this beauty DIY a try? < previous postNow Hiring! Get Yourself a New J-O-B, with Me! Glad to hear that Jessica. Thumbs up. Love this idea and the easy to follow steps! I think these would make great Galentine’s Day gifts too – yay! That’s a great idea for Galentines Day, Heidi. Good thinking! Awesome Rachael. Let me know if you give it a try. 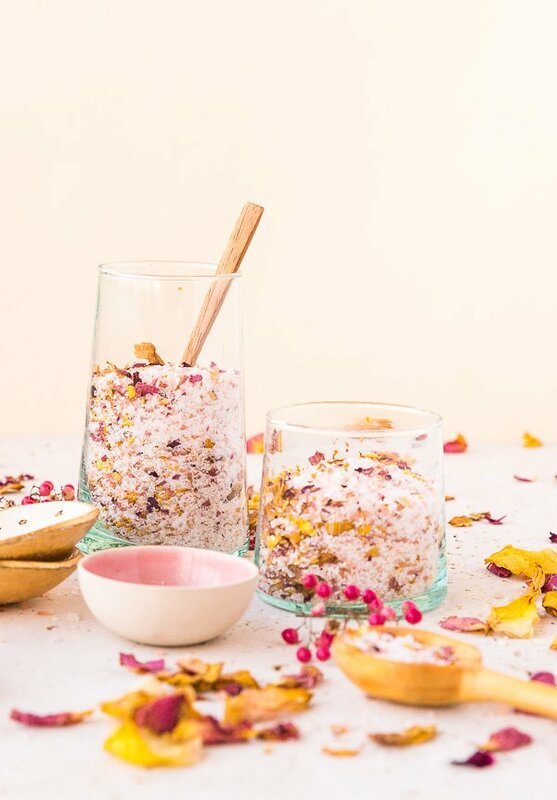 What a beautiful way to use rose petals, this is a perfect gift for someone special! 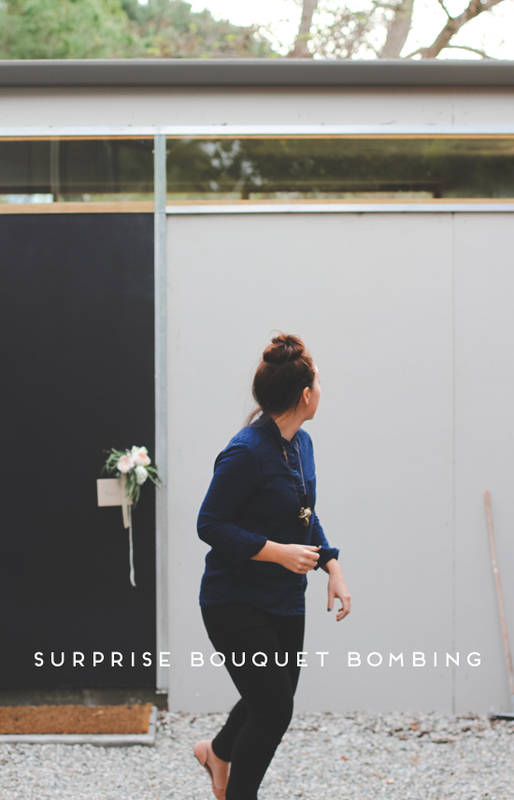 I always feel terrible when tossing flowers. They have a fairly short life span and look so good when they’re alive, but this is an awesome DIY to keep them going. Love it. I’m definitely going to give this a try soon! Also, your photos are just so beautiful! Completely hear you on hating to toss flowers, Fariha. Glad this is a project you could see yourself trying. These are fabulous and would be such beautiful gifts!! where are the containers from? I LOVE this project! so beautiful! I bookmarked this so I can make it for Christmas presents! 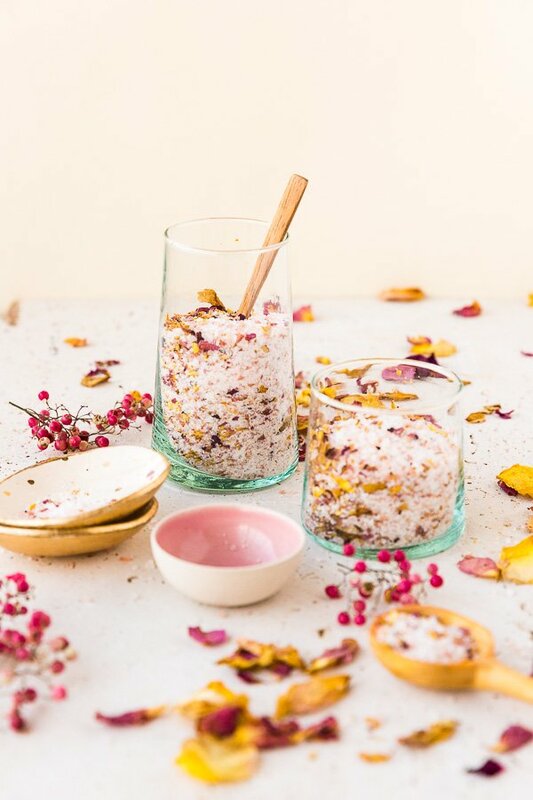 I will try these dry roses for make a good gift for a bridal shower, birthday party, or spa day with friends. They smell so good and look pretty too with all of the flower petal confetti pieces. Thank for share.